Photograph courtesy Phillip Moore On a fine afternoon 25298 poses at Chester, August 12th 1984. The eighteen year eleven month career of D7648/25298 included allocations to Eastern Region & London Midland Region depots. Built: Beyer Peacock Gorton Ltd, Works No.8058. October 1969 to Nottingham Division (D16). 25298 was the 237th Class 25 to be withdrawn, one of three retired during March 1985. After withdrawal 25298 was stored at Crewe Gresty Lane until January 23rd 1986 when it was moved (see details below) to Doncaster Works and broken up there during the last week of September 1986. Movement: 25210/237/298 10.20am Crewe Gresty Lane – Doncaster Works 9Z38 January 23rd 1986. Noted Derby WorksFebruary & April 1974 (dual brake equipment fitted). Noted Derby Works October & November 1983 (N4 repairs, main generator). On July 2nd 1966 the summer dated roundtrip Sheffield - Llandudno Town was worked by a very clean D7648. Condition July: green livery with small yellow warning panels, straight sided sandboxes, three-rung bogie mounted footsteps, exhaust in original position. A brakevan railtour between Liverpool & Huskisson Docks on December 2nd 1970 was worked by 7648. 25298 dragged three car Wirral set M28376M to Horwich Works on December 5th, the motor coach on this set being badly damaged. On May 24th 1975 the 09.11 Newcastle - Paignton was noted at Sheffield & Exeter with 25298 & 25235, if it is assumed that the Class 25s worked throughout 399 miles would have been worked, great stuff! 25298 was noted on local duties from Tyne Yard on May 18th. On June 18th 1977 the roundtrip Nottingham - Llandudno Town was worked by 25298. After 47500 failed at Bristol on December 27th 1978 with the 13.55 Glasgow – Taunton, the only available power was 25298 & 25318 for the run west. A lengthy mystery excursion on August 6th 1979 saw 25298 & 25273 work a round trip Melton Mowbray - Barmouth, for a total of 368 miles. The Mountsorrel – Kennett stone trains were frequently double headed, so noted were 25283 & 25298 on January 29th. When 31253 failed at Derby on June 6th working the 07.57 Weymouth - Bradford 25298 took over for the run to Leeds via Sheffield, Huddersfield & Bradford. On August 13th 25298 & 25301 were noted at Exeter with the 6M35 13.15 Exeter-Ellesmere Port empty tar tanks. 25298 was north of the border on September 17th working the 13.43 Kilmarnock - Stranraer Harbour. On August 29th 1982 25298 & 25251 assisted the 00.27 Manchester Piccadilly - Euston between Bletchley & Watford Junction and with 25322 assisted the 20.45 Barrow - Euston between Watford Junction & Willesden due to the power being off for engineering work. 25298 & 25322 were still together on September 4th & 5th when they worked the 4th's 10.10 Euston - Aberystwyth from Birmingham New Street, the 16.05 Aberystwyth - Shrewsbury and the 5th's 08.45 Birmingham New Street - Aberystwyth from Shrewsbury, the 16.40 Aberystwyth - Machynlleth and 17.25 return and finally the 18.15 Aberystwyth - Euston to Wolverhampton. Another visit was to Cambrian metals on September 11th when 25298 & 25277 worked the 07.38 Shrewsbury - Aberystwyth and the 10.07 Aberystwyth - Euston to Wolverhampton. During October 1982 25298 was transferred to Crewe. On October 20th 25298 was noted at York Yard south with a mixed freight. On November 25th 25298 was on banking duties at Manchester Victoria. The 22.47 Crewe - Blackpool North was worked forward from Preston on April 21st, 22nd & 23rd by 25298 (21st may have been 25282?). 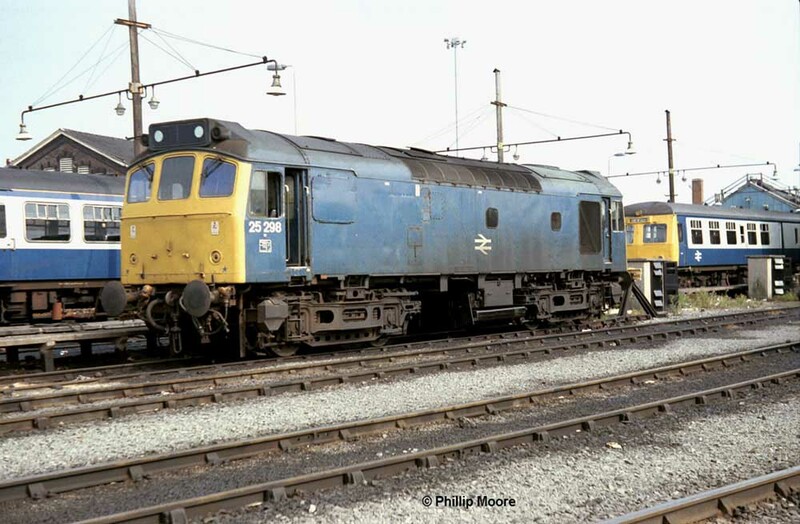 On July 12th 1983 overhead line problems saw 25298 assist two services between Nuneaton & Birmingham New Street and one service between Coventry & Nuneaton. On July 16th 1983 the 07.44 Shrewsbury - Aberystwyth with 25298 & 25320 was terminated at Machynlleth due to late running, returning as the 10.45 Machynlleth - Euston to Wolverhampton. The next day (17th) 25298 & 25320 were stabled at Rugby. On August 6th 1983 the 07.44 Shrewsbury - Aberystwyth and 10.10 Aberystwyth - Euston to Wolverhampton were worked by 25298 & 25288. On August 10th the Kings Cross -Tring cement empties were worked by 25324 & 25298. On September 5th 25300 & 25298 were noted passing through Chester station. 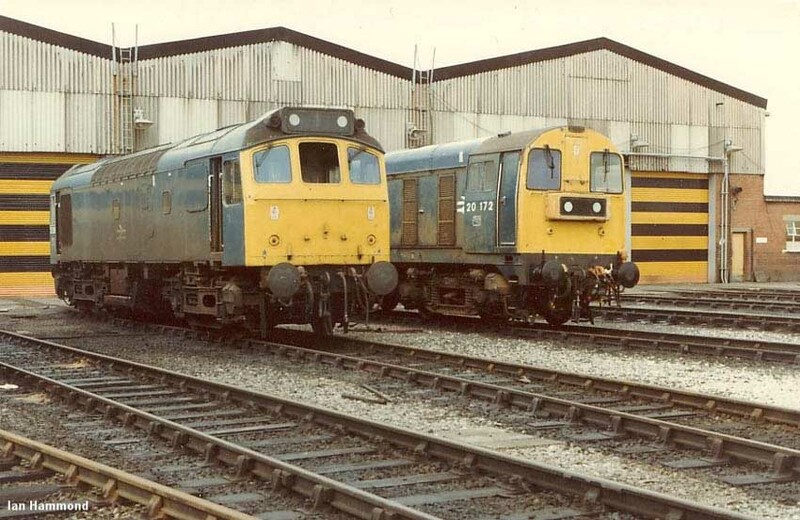 Photograph courtesy J Davenport Happy days at Warrington on April 7th 1984 with 25298 and a diesel multiple unit in tow. On April 30th 25298 was noted passing through Leamington Spa on an eight wagon MOD freight. 1984 produced more mileage over Cambrian metals. On July 7th 25298 & 25311 worked the 07.44 Shrewsbury - Aberystwyth and the 10.10 Aberystwyth - Euston to Wolverhampton. 25298 headed a short rake of mineral wagons past Abergele and Pensarn on August 15th. On August 25th 25298 & 25276 worked the 10.10 Euston - Aberystwyth from Wolverhampton and the 17.05 Aberystwyth - Shrewsbury. A week later on September 1st 1984 25298 & 25254 worked the 07.35 Euston - Aberystwyth from Wolverhampton, returning with the 14.00 Aberystwyth - Birmingham New Street to Wolverhampton, being extend due to late running. 25288 was on a Trans-Pennine working on September 15th 1984 working the 11.41 Manchester Piccadilly - Hull throughout. Engineering works with the power off on September 28th 1984 found 25298 working the 17.18 Liverpool - Birmingham New Street from Liverpool via Chester to Crewe. The next day (29th) the 11.05 Huddersfield - Small Heath football special was worked between Wolverhampton & Small Heath by 25298. On the last day of September the 11.40 Manchester – Gatwick behind 47331 became completely derailed approaching Dorridge station, car transporter wagons on an adjacent track prevented the derailing vehicles from tipping completely over. The Bescot crane arrived behind 25298, the re-railing train behind 25034 and a little later the Toton crane appeared behind 45017. On the late evening of October 19th 25298 was noted shunting parcels vans at Birmingham New Street. On October 27th 25298 was noted heading north through Crewe with a Class 304 unit. 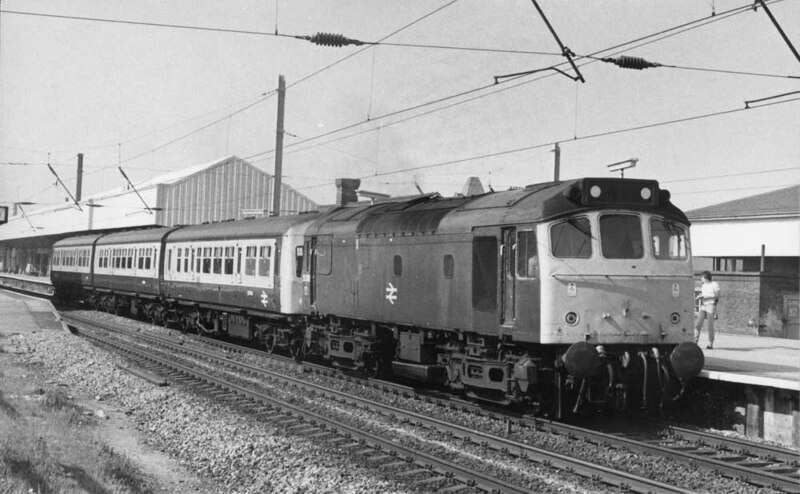 On October 28th the 11.50 Euston - Manchester Piccadilly was worked forward from Crewe by 25298 due to the power being off for engineering work. 25298 was stabled at Birkenhead Mollington Street on November 12th. The last recorded working for 25298 took place on February 15th 1985 working the 18.20 Glasgow Central - Manchester Victoria forward from Preston. Possibly because of the diminishing numbers of Class 25s there had been a greater frequency of Class 27s arriving at Tyne Yard from the Carlisle direction. So noted on February 22nd was 27026 arriving with a special freight, returning west light coupled to 25298. 25298 was withdrawn on March 19th 1985. Photograph courtesy Ian Hammond 25298 stands next to 20172 at Crewe on April 1st 1985. Apart from the missing window 25298 appears ready for its next duty, but it has been withdrawn for about a month. Last updated February 14th 2019.